Well, another year or two has passed and I have managed to not sit in front of a computer or not log on for long enough to update my blogs. I have been living and dying and struggling through...laughing and crying and learning how to be myself again. Life keeps on happening as it always does. We learn to grow on, grow up, and hold on and let go for dear life. A sincere hug has been life changing. A genuine conversation has been even more enlightening. Who knew these things could be so rare? I am thankful to all who have sent their "Well wishes, good vibes, prayer support, and any efforts made towards re-connecting." Sure has helped through all the ups and downs. On future post I will try to share some more of what I have been learning. For now, I will have to say that I have recently learned that I have grown accustomed to not listening to my 'gut feeling' or ignored my intuition long enough that it became a way of life. One day at a time, I am learning to listen and stop ignoring my feelings. I am thankful to have feelings...interesting to learn they are a God given gift that help us to know we are still alive. Well, folks...a few months has passed by for obvious reasons (and some not so obvious reasons). 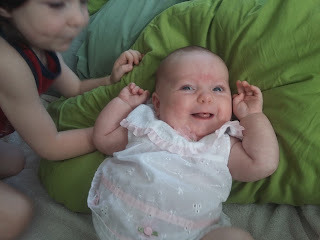 We had our little precious Princess Eliana back in May. 7lbs 13oz 18 inches long. As it turns out, we did not end up having her at a birthing center as planned. Got all the way to 41 weeks of pregnancy for them to tell us there was no fluid in there and it was all baby and umbilical chord. Had to go to the hospital and according to them "Get her out..." At one point there was talk about having a C-section bc they said she was not passing the none stress test and it could be too much for her. I was already 2 centimeters dialated. They wanted to induce (something I was determined to avoid unless there was no other way). So I agreed to a partial induction (Foley Bulb). Got to 4 or so when they pulled it out and then the rest of the time spent walking around and making some calls and praying. After about 2 hours maybe hard labor...she pretty much was on the scene in two pushes and sixty seconds. Praise God for His amazing goodness and gentle kindness to deliver us all. All was well and she was fine and strong and made it through labor and delivery just fine. Just about two months old in the picture here. Shiloh loves her - and that's an understatement. Thank you all for your loving prayers and support and encouragements throughout the months leading up to our huge blessing. Her name is Eliana which means, GOD HAS HEARD. He surely has. For a long few months we had been looking for housing... and the LORD faithfully provided in every season. We are now in a 2bdrm apartment in Longmont, Colorado right outside of Boulder. How perfectly the Lord has met our needs and given us a place to call Home. Any of our friends that would like to come visit... our doors are open to you text or email and we will gladly make time for you. Baby will be here in another ten weeks...and we found a birthing center that seems to be a good fit for us. We have been in Longmont/Boulder, Colorado for just about a month now. We are currently looking for housing and full time employment, meanwhile, the Lord provides. Before coming to Boulder area we were in woodland, Park for about six weeks. We have enjoyed our time in Colorado and we are hopeful and awaiting direction from the Lord on what the future is going to look like. Shiloh is a few days away from his two year old birthday. The first part of September we found out we are expecting baby #2 in May 2016. We were in Lillian, Alabama for six weeks and Foley, AL visiting friends and family. Then onto Columbia, Missouri for three weeks visiting more friends and family. About to say hello to Oklahoma and Colorado --- just text or msg us if you are wondering where in the world we are. A few days after Shiloh's first haircut. Packing up and heading out of the Northwest for a while. Hopefully on our way to see some of my family and friends in the south east. IS THERE ANY DIFFERENCE BETWEEN US AND THE WORLD? The wicked boasteth of his heart's desire, and blesseth the covetous, whom the Lord abhorreth.